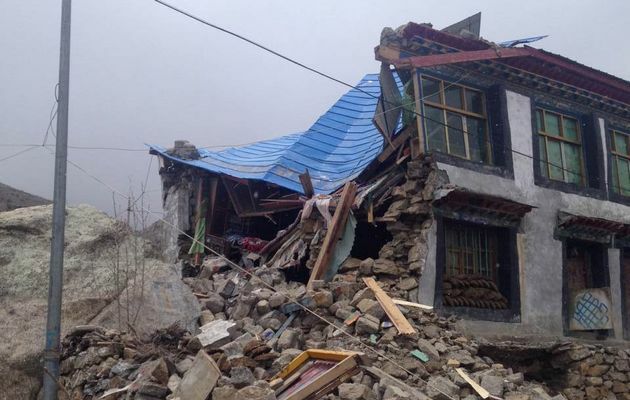 House damaged during the earth quack in Kyirong of southwest Tibet on April 25, 2015. (TibetanReview.net, Apr29, 2015) – The death toll in neighbouring areas of Tibet from the 7.9-magnitude earthquake which shook Nepal on Apr 25, followed by scores of aftershocks, had reached 25, reported China’s official Xinhua news agency Apr 28. The report added that a total of 383 people were injured. The report said the quake toppled 2,500 houses and damaged 24,700 others across 19 counties, affecting nearly 300,000 people, among whom 47,500 were displaced. It added that a total of 82 temples were also damaged. A previous report said one temple had collapsed. The counties of Kyirong, Nyalam and Dingri in Shigatse City were the ones in Tibet most affected by the earthquake. The report said nearly 80 percent of the houses in these three counties had collapsed. Previous official Chinese media reports said a total of 24,800 people had been relocated in Shigatse City. The city has 18 counties and a population of 700,000. Previous reports also said the counties of Saga, Zhongba (Drongpa), Yadong (Yatung or Dromo), Lhaze, and Burang (Purang) in Ngari, Shigatse, Gyantse, Lhoka, and Nyingtri prefectures along the Himalayan belt bordering Nepal and India were also affected by the earthquake. In Nepal, the death toll had touched 5,057 by Apr 29 morning, with the country’s Prime Minister being quoted as saying the total could reach 10,000. Around 8,000 were reported injured, with the numbering of the missing being yet to be worked out. Three Tibetans were known to be among the dead in Nepal. In India, around 70 people were reported to have died as a result of the earthquake.